Year after year, the State of Florida trails only Texas when it comes to the number of reported motorcycle accident fatalities, and that is an alarming statistic for any bike enthusiast in Miami-Dade County, Broward County, or Palm Beach County. If you or one of your loved ones was thrown off a motorcycle by a careless or distracted driver of a motor vehicle, or sustained any injury, property damage, lost wages, or emotional suffering as the result of a mishap while riding a motorcycle, the Law Offices of Brumer & Brumer can help you recover a monetary award from the negligent party. Just as with instances of accidents involving cars or SUVs, the insurance company that represents the party that crashed into your motorcycle will work its hardest to minimize the amount it will be legally responsible to pay you. It will attempt to do this by locking you into a story, coercing you into admitting information that simply was not true and accurate, or perhaps bamboozling you into accepting a settlement offer far below that to which you are entitled. We therefore encourage you to immediately call Brumer & Brumer, a top personal injury law firm in Miami. Once our services are retained, we will speak with all insurance company personnel and claims adjusters on your behalf. That will accomplish two important objectives. First, it will allow you to focus on what's most important -- your recovery. And second, it will prevent you from being tricked by the insurance companies, who are expert at convincing injury victims of all sorts of delusional theories and suppositions as to how or why the accident took place. 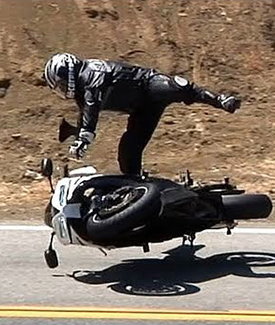 Even the most cautious motorcycle driver who is properly protected with a helmet and pads, can sustain life-altering injuries at the hands of an irresponsible fellow motorist. That is why an experienced, knowledgeable, and resourceful personal injury law firm is needed to champion your rights if you've been rear-ended, sideswiped, or rammed while legally and safely operating your motorcycle on the streets of South Florida. It's embarrassing to admit, but South Florida is home to some of the country's very worst drivers. With so many visual distractions festooning busy roads like Ocean Drive on Miami Beach and Las Olas Boulevard in the heart of downtown Fort Lauderdale, it's easy for South Florida drivers to lose their concentration and plow into a motorcycle. And motorcycles, like Ducatis, Harley-Davidsons, Yamahas, and BMWs, are known to eject their riders even upon impact of a slow-speed collision. That leaves the operators of these bikes in a terribly vulnerable position. Our personal injury law firm has been fighting for the rights of motorcycle accident victims for the last five-plus decades. We stay current with changing legislation and understand what it takes to bring an action against motorists and the companies that insure their vehicles.